In 1816, summer failed to make an appearance in central Europe and people were starving. Just a year earlier, the Tambora volcano had erupted in Indonesia, spewing huge amounts of ash and sulphur into the atmosphere. As these particles partly blocked sunlight, cooling the climate, it had a serious impact on the land and the people, even in Switzerland. 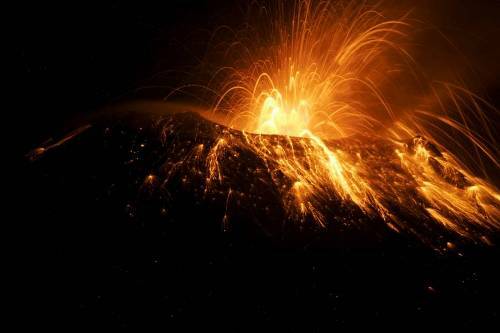 Since then, volcanologists have developed more precise ideas of why super-volcanoes such as Tambora are not only highly explosive but also why they release so much sulphur into the atmosphere. Gas bubbles tend to accumulate in the upper layers of magma reservoirs, which are only a few kilometres beneath the earth’s surface, building up pressure that can then be abruptly liberated by eruption. These bubbles mainly contain water vapour but also sulphur. 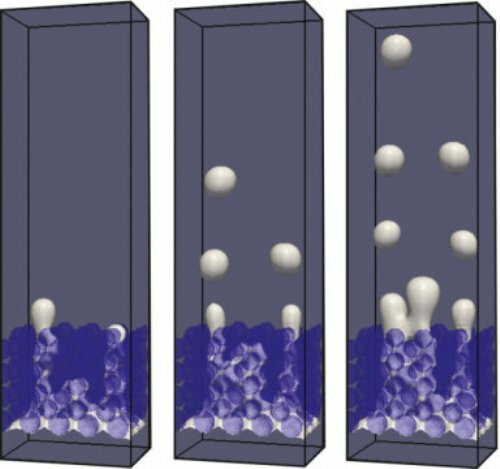 Together with other scientists from ETH Zurich and Georgia Institute of Technology (Georgia Tech), the researchers studied the behaviour of bubbles with a computer model. The scientists used theoretical calculations and laboratory experiments to examine in particular how bubbles in crystal-rich and crystal-poor layers of magma reservoirs move buoyantly upward. In many volcanic systems, the magma reservoir consists mainly of two zones: an upper layer consisting of viscous melt with almost no crystals, and a lower layer rich in crystals, but still containing pore space. When Andrea Parmigiani, Christian Huber and Olivier Bachmann started this project, they thought that the bubbles, as they moved upwards through crystal-rich areas of the magma reservoirs, would dramatically slow down, while they would go faster in the crystal-poor zones. “Instead, we found that, under volatile-rich conditions, they would ascend much faster in the crystal-rich zones, and accumulate in the melt-rich portions above” says Parmigiani. Parmigiani explains this as follows: when the proportion of bubbles in the pore space of the crystal-rich layers increases, small individual bubbles coalesce into finger-like channels, displacing the existing highly viscous melt. These finger-like channels allow for a higher vertical gas velocity. The bubbles, however, have to fill at least 10 to 15 % of the pore space. “If the vapour phase cannot form these channels, individual bubbles are mechanically trapped,” says the earth scientist. As these finger-like channels reach the boundary of the crystal-poor melt, individual, more spherical bubbles detach, and continue their ascent towards the surface. However, the more bubble, the more reduce their migration velocity is. This is because each bubble creates a return flow of viscous melt around it. When an adjacent bubble feels this return flow, it is slowed down. This process was demonstrated in a laboratory experiment conducted by Parmigiani’s colleagues Salah Faroughi and Christian Huber at Georgia Tech, using water bubbles in a viscous silicone solution. “Through this mechanism, a large number of gas bubbles can accumulate in the crystal-poor melt under the roof of the magma reservoir. This eventually leads to overpressurization of the reservoir,” says lead author Parmigiani. And because the bubbles also contain sulphur, this also accumulates, explaining why such a volcano might emit more sulphur than expected based on its composition. What this means for the explosivity of a given volcano is still unclear. “This study focuses primarily on understanding the basic principles of gas flow in magma reservoirs; a direct application to prediction of volcanic behaviour remains a question for the future,” says the researcher, adding that existing computer models do not depict the entire magma reservoir, but only a tiny part of it: roughly a square of a few cubic centimeter with a clear boundary between the crystal-poor and crystal-rich layers. To calculate this small volume, Parmigiani used high-performance computers such as the Euler Cluster at ETH Zurich and a supercomputer at the Swiss National Supercomputing Centre in Lugano. For the software, the researcher had access to the open-source library Palabos, which he continues to develop in collaboration with researchers from University of Geneva. “This software is particularly suitable for this type of simulation,” says the physicist. 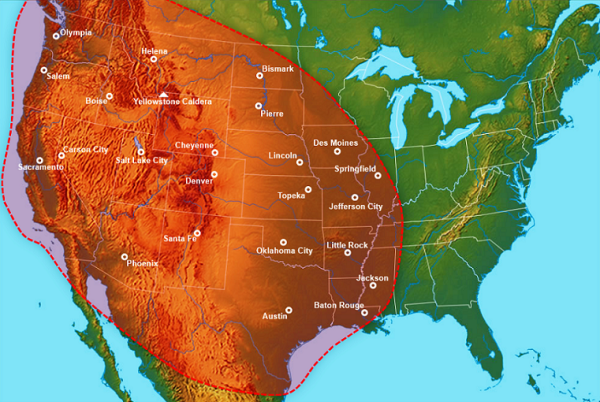 New research published today in the journal Geological Society of America, has discovered the 12 recorded mega-eruptions of the Yellowstone super-volcano or (caldera) located in the north-central US states of Idaho, Montana, and Wyoming near the U.S./Canadian border – have been found to be were ‘significantly larger’ than research has previously suggested. Dr Tom Knott, Professor Mike Branney and Dr Marc Reichow, from the University of Leicester’s Department of Geology’s Volcanology Group, conducted the research with a team of international collaborators from the University of California at Santa Cruz, the University of Copenhagen, Denmark and Idaho State University. Using a multi-technique approach, including whole-rock and mineral chemistries, palaeomagnetic data and radio-isotopic dates – the team has been able to ‘fingerprint’ individual eruption deposits and correlate these over vast regions covering over 620 sq. miles (1000 km2). In establishing widespread correlations, the team drastically reduced the number of eruptions previously thought to have originated from the central Snake River Plain by more than half. 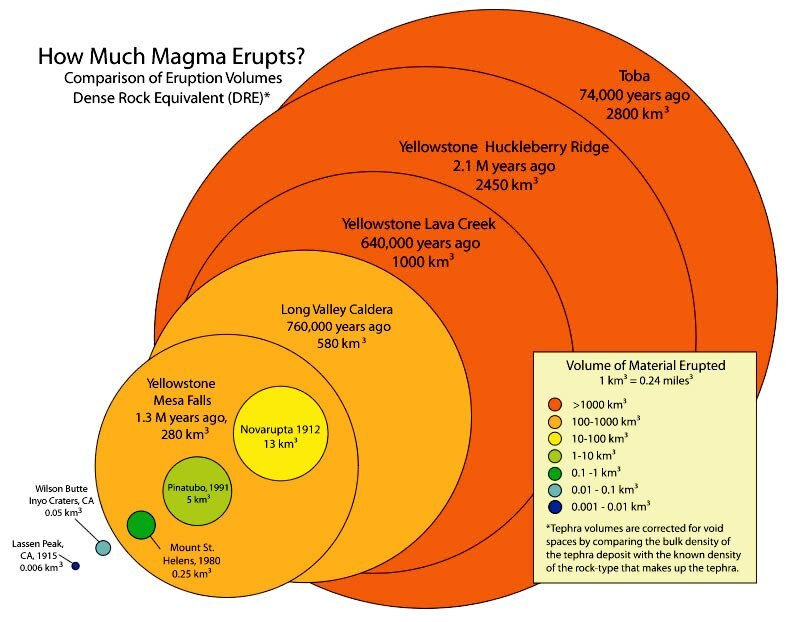 This is just one of 12 giant eruptions reported from the area by the Leicester team, who show that intense hotspot magmatism caused major crustal subsidence, forming the 100 km-wide Snake River Basin. The team also demonstrates that these eruptions were in fact significantly larger than previously thought and may rival those better known at Yellowstone. Dr Knott said: “While it is well-know that Yellowstone has erupted catastrophically in recent times perhaps less widely appreciated is that these were just the latest in a protracted history of numerous catastrophic super-eruptions that have burned a track along the Snake River eastwards from Oregon to Yellowstone from 16 Ma to present. Several former University of Leicester undergraduates, including Mark Baldwin, Stuart Hatter, Liam McDonnell, Fabian Wadsworth and Luke Wooldridge, helped with the US fieldwork. They also enjoyed the opportunity of gaining experience through interacting with the international scientists, such as palaeomagnetists David Finn and Rob Coe of the University of California, Santa Cruz. 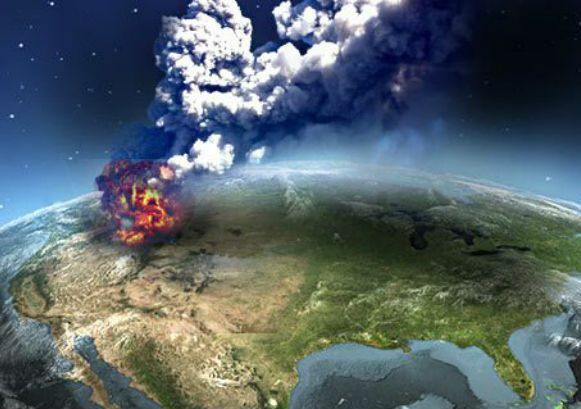 A number of giant super-eruptions between 8 and 12 million years ago that could be larger than the colossal eruptions known to have taken place at Yellowstone have been identified in the United States through research led by the University of Leicester. 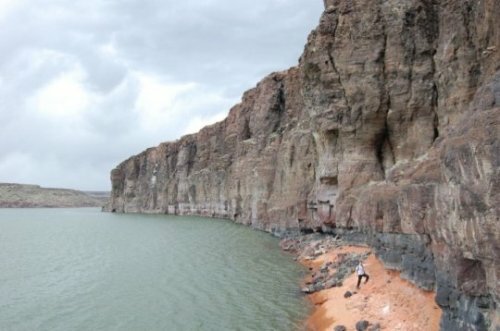 The international research team suggests that while the number of volcanic eruptions thought to have originated from the central Snake River Plain in Idaho, USA is less than previously believed, the 12 recorded giant eruptions were likely ‘significantly larger’ than research has previously suggested. Dr Tom Knott, Professor Mike Branney and Dr Marc Reichow, from the University of Leicester’s Department of Geology’s Volcanology Group, conducted the research with a team of international collaborators from the University of California, Santa Cruz, USA, the University of Copenhagen, Denmark and Idaho State University, USA. Using a multi-technique approach, including whole-rock and mineral chemistries, palaeomagnetic data, and radio-isotopic dates, the team has been able to ‘fingerprint’ individual eruption deposits and correlate these over vast regions (e.g., 1000’s km2). 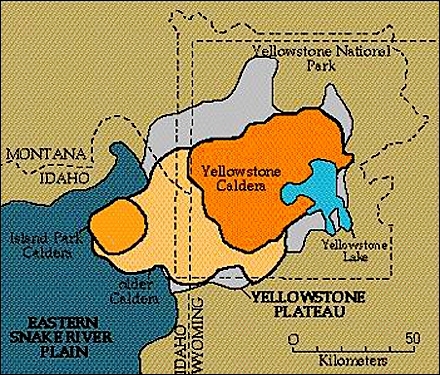 The researchers have reported that one of the super-eruptions from the Yellowstone hotspot-track, defined as the Castleford Crossing eruption, occurred about 8.1 million years ago and estimate the eruption volume to have exceeded 1,900 km3. The single volcanic sheet covers an area over 14,000 km2 in southern Idaho, and is more than 1.3 km thick in the caldera of the super-volcano. Ecuador’s Tungurahua volcano has been putting on a dramatic show, spewing lava from a cauldron-like crater and launching towering clouds of ash and gas. The country’s Geophysical Institute said Sunday the column of ash reached a maximum height of about 2 miles (3 km) in recent hours, while it hurled blocks of glowing rock about a mile (1.5 km) down its slopes. The 16,480-foot (5,023 meter) peak is about 85 miles (140 km) south of Quito, the capital, and close to the tourist center of Banos. It’s been periodically erupting since 1999. Bulusan Volcano spewed a grayish steam and an ash column reaching 500 meters on Monday afternoon, February 22, the Philippine Institute of Volcanology and Seismology (PHIVOLCS) said. In the latest bulletin issued by PHIVOLCS at 6:00 pm, Bulusan Volcano’s ash fall occurred at 5:01 pm, which also reflected as an explosion type earthquake that lasted for four minutes and twenty-one seconds. PHIVOLCS detected a total of 12 volcanic earthquakes prior to the ash fall. The agency raised Alert Level 1 over Bulusan Volcano and the public is reminded not to go inside the 4-kilometer radius Permanent Danger Zone (PDZ) due to risks of sudden steam and ash explosions. 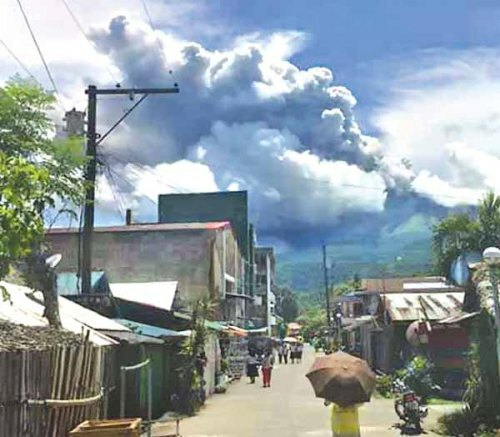 PHIVOLCS said it is closely monitoring the volcano’s activity and advised residents located in the northwest and southwest sectors of the volcano to take precautions against ash falls. PHIVOLCS also reminded residents near valleys and river channels to be watchful against lahar. Bulusan Volcano is the southernmost volcano on Luzon Island. It is located in the province of Sorsogon in the Bicol region, 70 km southeast of Mayon Volcano and approximately 250 km southeast of Manila. It is considered as the Philippines’ 4th most active volcano after Mayon, Taal, and Kanlaon. Its last eruption was in June 2015. Mount Soputan volcano in North Sulawesi province of Indonesia erupted several times on Sunday, spewing a column of hot ash by up to 2.5 km high, official of disaster management agency said. Mount Soputan, located some 60 km from Manado, capital of the province, has high potential for further big eruption which is indicated by persistent tremors with amplitude of 41 mm, Spokesman of National Disaster Management Agency Sutopo Purwo Nugroho disclosed. Several subdistricts in Minahasa Tenggara district were hit by rains of ash and volcanic materials that the local disaster agency distributes masks to protect local residents from the impact, he told Xinhua via phone. The authorities have banned villagers or visitors from entering the area of 4 km from the crater, but at the southwest of the crater the evacuation zone is at 6. 5 km, Mr. Sutopo said. The 1,874- meter high Mount Soputan is one of Indonesia’s active volcanoes whose number is about 129, according to the National Volcanology Agency. The volcano sits in between two cities, Kagoshima on its west and Tarumizu on its east. 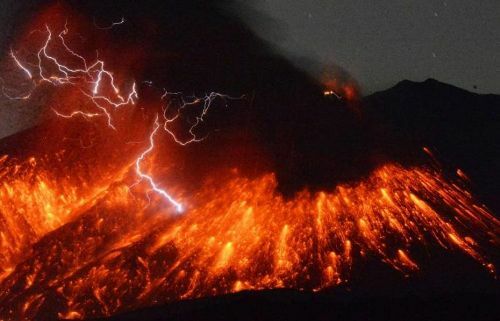 “Lightning is sometimes observed in the plume associated with eruption of this type,” Manabu Hashimoto, a professor at the Disaster Prevention Research Institute at Kyoto University, told ABC News in an email today. This eruption, although visually intense, was average compared to Sakurajima’s past eruptions, the AP reported. One eruption in 1914 was the most powerful eruption in Japan in the twentieth century, and even generated lava flows, which are rare in Japan, for several months. Sakurajima has been on the watch since Aug. 15, 2015, when volcanic earthquakes caused JMA to issue a level 4 volcanic warning to prepare to evacuate. There were very small eruptions recorded since Aug. 19, but by Sept. 1 the agency was able to lower the warning back down to a level 3. Japan has 110 active volcanoes, according to JMA, which is no surprise as it sits on the Ring of Fire circling the Pacific rim, being one of the most active seismic and volcanic zones in the world. There are approximately 15 volcanic events, including eruptions, which occur every year.